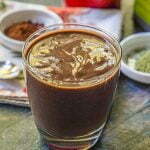 This low carb dark chocolate protein smoothie is rich and creamy full of healthy ingredients like matcha green tea. It's the perfect way to start your morning or give you a lift in the afternoon. Only 2.5g net carbs and 220 calories per smoothie! Add all ingredients to a high speed blender and blend until the avocado makes it smooth and creamy. Pour and drink! ** Ingredients I used. I like Isopure Zero Carb Protein powder and CarbSmart protein powders because they have no carbs. I used Guittards cocoa rouge cocoa powder but you can use whatever you wish. I also used Swerved sweetener but you can use whatever sweetener you like.